The Numerical Death of the Magpie?? This is of great importance to you and your Fantasy football team. Why? Of course, still choose Pendlebury and consider Swan. But Collingwood’s general level of achievement in 2012 will have a great impact on their sub-premium player’s scoring consistency. If my forcasting is correct, big question marks hang over Beams, Blair, Cloke, Fasolo, Goldsack, Macaffer, O’Brien, Reid, Shaw and even Thomas. 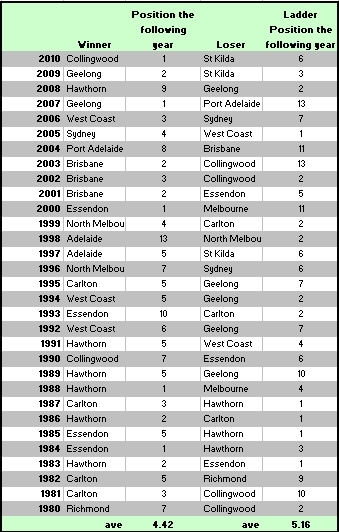 It is interesting to note, that both the winning team and the losing team of an AFL Grandfinal are likey to finish out of a top 4 ladder position the following year, thus making a back-to-back flag extremely unlikey. Graphing each data set and applying some modelling yields a rather interesting result – LOSING A GRANDFINAL DOES CARRY WITH IT A STATISTICAL HANG-OVER EFFECT. The line, or regression equation, is trending up. This indicates that over the years, the impact of losing a Grand Final is having a greater “hang-over” effect on teams. This makes sense. The more professional and financial teams become, the more even the playing field. The more closely matched teams become in skill and physicality, the greater the effect that the psychological state of players and teams has on a game results. Using the predictor equation, it is expected that Collingwood will finish in 6th position on the ladder in 2012. ” The draw …will provide a big challenge for Buckley in his first year as senior coach”. The facts are that Collingwood play six of last years top 8 twice and have a new, inexperienced coach. The facts are that Collingwood changed noticably in there general performance outputs towards the end of season 2011. While you could argure that this was due to player rotations, I could more convincely argue that this gave them less reason to underperform when it mattered – When it mattered they were out-classed. They fell over the line against Hawthorn and were exposed in the Grand final by Geelong. Mathematics is about predicting the seemingly unpredictable. It is also about attributing reason to events. In Round One, 2012, Collingwood take on Hawthorn. My early models are predicting a Hawthorn victory and the beginning of the Buckley doubts. A predictable back page photo, subsequent quotes such as “Buckley’s Hope” ….. These niggling doubts could quite possibly manifest to the point we see a resurgance of “The Collywobbles”. Agree, disagree, BUT whatever you do, before you sit down to build your 2012 Fantasy Squad, consider very carfully the influence of team success when selecting your sub-premiums. Love it. May not happen that way — new coaches often freshen up club's approach with fringe players seeing it as their chance to start fresh — but your case is well reasoned and compelling. Collingwood were also lucky to beat West Coast in the finals last year. West Coast looked like winning until Cox went off injured. Collingwood were very very lucky to get past Hawthorn in the prelim. I recall there were two dodgy free kicks in the last few minutes (one not paid to Hawthorn (Sam Mitchell?) and then one paid to Collingwood) that helped them win. word on the street is that Buck's is struggling …… Rocket stepping in more than an assistant should …… think you may be onto something here Higgo! I was waiting for a mathematician's eye to pick up this ommision. As you can see from the form of the data points around the line, Pearson's Correlation Coefficient is rather weak(0.27) indicating a weak linear relationship. Delving further into the statistical origin of the data, this weak correlation can be attributed to by an expanding competition over the seasons. This is a fine example of spin, where statistics prove that statistics can prove anything! Hope you enjoyed this lesson in mathematical fun.